The Information, a technology publication founded by former Wall Street Journal reporter Jessica Lessin, recently released its first monthly survey about its subscribers, called “Subscriber Viewpoint.” Subscribers to The information include some of the biggest entrepreneurs, executives, policymakers, and investors in Silicon Valley, including billionaire investor Marc Andreessen. 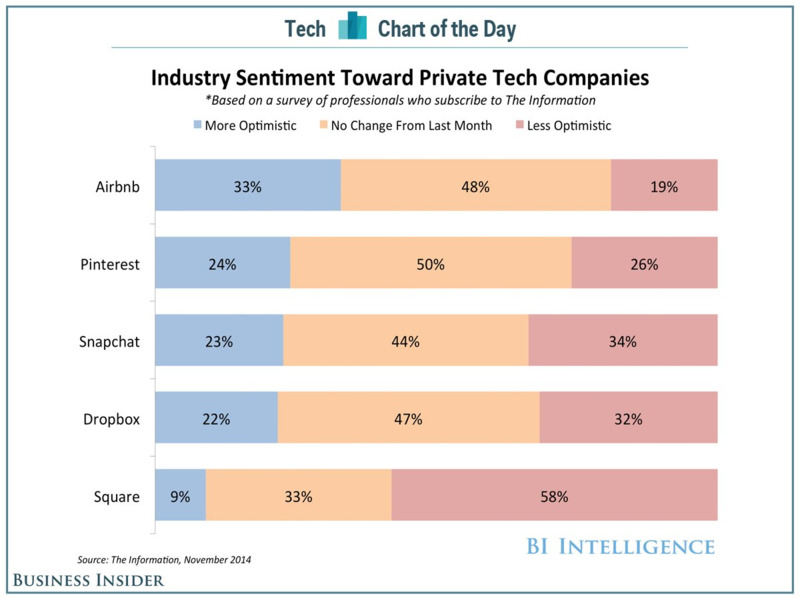 Based on data from The Information’s first survey, which was charted for us by BI Intelligence, the only private company readers are optimistic about, in terms of long-term potential, is Airbnb, the company that lets you rent apartments and homes from strangers for vacations, business trips, and the like. Subscribers are less optimistic about almost every other major private tech company — especially Square, Jack Dorsey’s payment processing startup. This drop in optimism might have to do with Apple Pay, Apple’s mobile payment service introduced in October, which could eventually threaten Square’s core business.